Take the BTS Skytrain to Thong Lo Station and leave by Exit 1. Walk 10 meters to Soi 53 and turn right. Books @ 53 is about 200 meters down the Soi on the left. 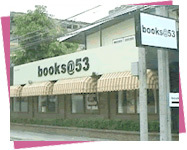 Books @ 53 is currently under renovation, and is expected to re-open in early 2014. However, business is being conducted as usual from our head office and we are still participating in book fairs at various international schools, both in Bangkok and in the provinces. Please contact Mam by phone at 081-618 8315 or by email at mambooks53@yahoo.com or visnu@nibondhbooks.com for all your requirements.